Steak and ale pie might seem like one of those dishes that you can only get in a pub somewhere in Yorkshire with a side of mashed potatoes, green peas and a decent mug of lager or two. Where else could people master such a flaky crust, luscious gravy and tender chunks of steak better than the those who have been doing it for generations? After many trials, failures and culinary catastrophes, I believe that I, an American girl from Seattle, have succeeded in creating a steak and ale pie worthy of British citizenship or at least indefinite leave to remain. This pie is a lot of work, I’m not going to lie about that. 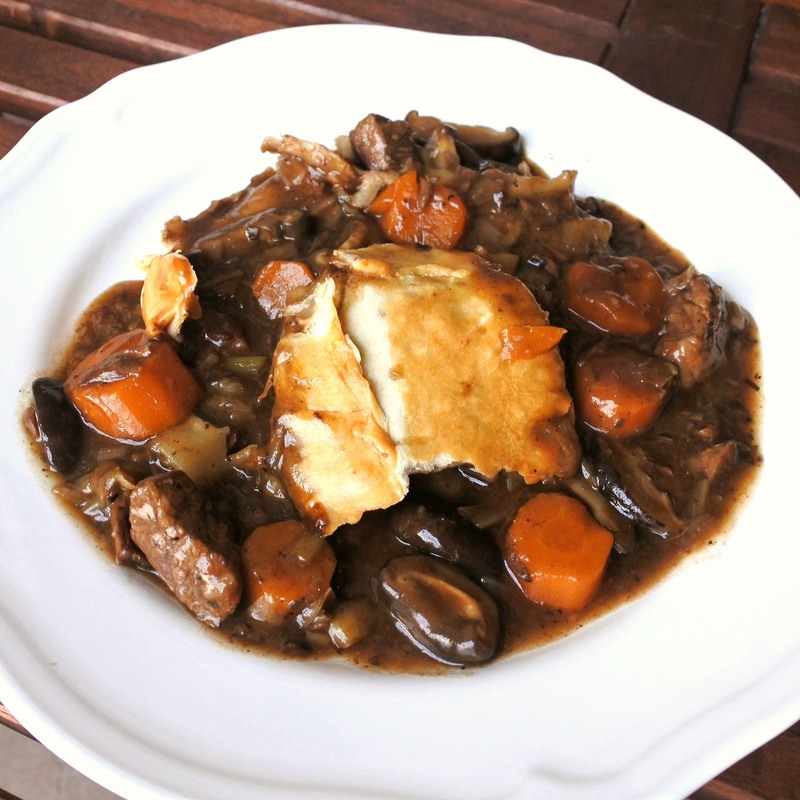 You can take shortcuts if you’d like by using pre-made and store bought short crust pastry or stock. However, if you want that authentic taste, you have to do the work. Particularly when it comes to the stock because the pie lives and dies on good stock. Personally, when I make this dish, I spread out the labor over a couple of days. I’ll make the stock over the weekend or whenever I have the time then freeze it for later (you can never have too much good stock in hand). The same can be done with the crust, which is less time consuming. Although it takes a while to put together, it actually involves little actually physical labor. Like all good things, this takes time but it’s worth it in every bite. I personally like to take a Sunday off to make it. I make the stock in the morning then move onto the stew in the afternoon and finally putting the pie together in the last afternoon. Besides, you can always pass the time by imbibing in a pint or two, three, ok…maybe 4 pints…and some crisps. Roughly cut up an onion and toss it with the beef soup bones on a baking tray. Sprinkle with salt and pepper and roast in the over at 200C/400F for an hour. When finished roasting, transfer roasted onions and bones to a medium/large pot. Add black peppercorns, garlic and Worcestershire sauce. Add 2-3 L of water to everything and cook at a low boil for at least an hour (if you are cooking with beef marrow, let simmer for at least 8 hours). Add water as you go, if needed. The longer you cook it, the better it will be. When finished cooking, let cool and run through a sieve. Separate the meat from the bones and add to the stock. Season with salt to taste. It should make around 6 cups of stock. Cut up topside into small chunks, season with salt and pepper and sprinkle with flour. Toss to even coat. In a large pot, add 2-3 tbsp of olive oil and heat over medium high heat. Add chunks of steak and cook until browned. Add onion and cook until soft then add the rosemary sprigs and cook for a minute or so more. Increase heat, add Guinness and deglaze the pan. Bring to a boil. Cook for 1-2 minutes then add stock. Add chopped vegetables and tomato paste, stir to combine and cook partially covered on low-medium heat for an hour. After an hour, add cornstarch mixed with water and cook for an additional 5 minutes until thick. Combine flour, honey, sea salt and baking powder together until thoroughly combined. Add pork fat/butter/shortening and incorporate as best as you can into the flour mixture using your hands or a food processor. Mixture should be crumbly. Add ice cold water a little at a time until dough has just come together but is still on the dry side. You’ve added too much water if it’s wet and sticky. Gather it together in one big mound, wrap it in cling film and refrigerate for at least an hour. When ready, take dough out from the refrigerator and cut it in half. Roll it out flat to your desired thickness and fit it to your baking tray/pie tin. Place filling inside and cover with the other half of pastry crust. Fold it together as best as you can and bake in oven at 200C/400F or until crust is brown and crispy. Serve pie on its own or with mash, peas and a pint for an authentic pub lunch. Is it shameful to say that we, as a family, have eaten 2 steak and ale pies this week? Needless to say, this is a family favorite.